This dish, really, is Thai-inspired. I've borrowed many of the flavours from the traditional Thai beef salad, but used lots of mint rather than coriander, and stripped it back to only the beef. You cook the beef briefly in a frypan (and grilling it on a barbecue would be great too) and then toss it in a salty soy dressing with hot chillies and bundles of mint. I served it with steamed rice and spicy stir-fried green beans (recipe coming soon), and we also improvised by wrapping strips of the beef up in cold, crisp iceburg lettuce leaves. 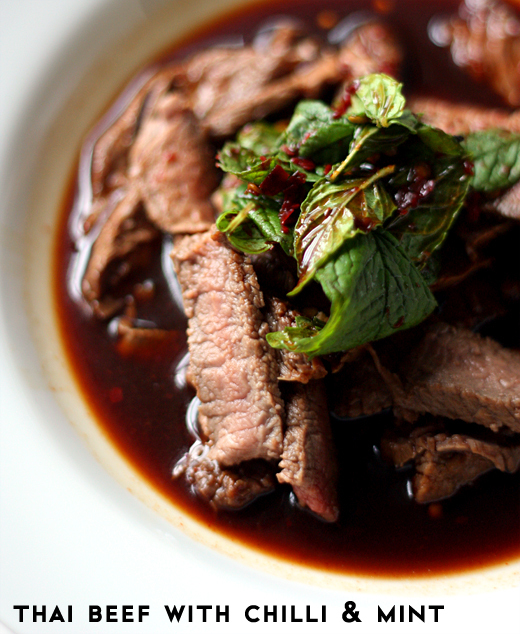 Trim the steak of excess fat and place it in a shallow dish with 4 tbsp of the soy sauce. Marinate for at least one hour. While the steak is marinating, make the sauce. Combine 1 tbsp of the soy sauce with the fish sauce, fresh lime juice, sugar, chopped chillies and mint leaves. Mix well. Lightly oil a skillet or frying pan and place over a medium-high heat. Once the frying pan is hot, lift the steak out of its marinade and place in the pan. Cook for 3 minutes on each side for medium-rare, or longer to taste. Remove the steak from the pan and place on a plate, leaving it to rest, uncovered, for 5 minutes. After the steak has rested, use a sharp knife to thinly slice it. Mix the slices with the sauce, and serve immediately. * I've never had much luck finding these chillies in America, so if they aren't available, use another hot red chilli pepper. You might need more or less than 2, though. Great photo! That sauce looks so silky. Yum. That looks so good! I love Thai food! a perfect dish for the summertime! This sounds nice and simple and tasty!